The penultimate knot in our series is the knot 7_6, in both standard conformation and the spiral S(5,2,(1,1,-1,1)) conformation from Day 234. Settings: Makerbot Replicator 2 on .3mm/low with custom knot slicing settings. 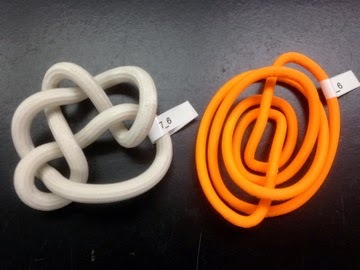 The knot requires almost no support material if you print it end-up instead of flat on its side. Technical notes, spiral flavor: It isn't known whether or not all knots have a spiral representation. As of the time of this blog post we know that eight of the fifteen knots through seven crossings are spiral. The spiral notation S(n,k,(....)) denotes that the knot can be represented as an n-strand braid periodic knot with k repetitions and over/under spiral pattern determined by the vector in parentheses.